If you are considering an upgrade from your present unit, you may want to consider one of the many smart garage door openers that are on the market. These advanced models have sophisticated communications systems that allow you to open and close your door no matter where in the world you may be located. If you’re heading out of town and you all of a sudden can’t remember whether your door is shut, all you have to do is check your smartphone to make sure – if it’s open, you can use your phone to close it. 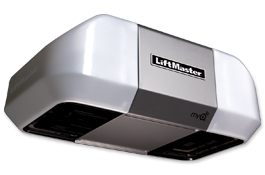 While there are many of these incredible smart garage door openers available, we’re going to focus on three: the LiftMaster® Elite Series® 8550 and Premium Series 8360, and the Genie IntelliG 1000. This model, as well as the 8360, has built-in technology that not only lets you shut your door from anywhere in the world using your smartphone or computer, but also turn your house lights on and off. It has a radio that has twice the range of a traditional opener and operates in several different frequencies so you don’t have to worry about interference negatively affecting performance. In addition, every time you use your remote control it uses a different code for extra security. This model provides a battery backup system that is compatible with chain drive, carriage house and solid wood doors. It also provides a special feature that will ensure you never leave your door open by accident. Called “Timer-to-Close,” this feature allows you to program the number of minutes you want your door to remain open. The IntelliG 1000 offers quest operation and a motor powerful enough to operate nearly any size of garage door. As with all smart garage door openers, it allows total control wherever you may be located. It also continually monitors operation to increase safety. Like the LiftMaster models, it also uses a new code every time you use your remote to prevent anyone from pirating the radio signal. If you would like to learn more about these or any other smart garage door openers, or you would like to have one installed on your residential or commercial property, contact Action Garage Door online or call us at one of the local numbers at the top of this page..